Is Koei's 137th Dynastry Warriors iteration an improvement over 136? Our final thoughts! Why is it that Koei improves certain things in a game without improving what needs a boost the most? I'm talking about the constant barrage of Dynasty Warriors games that continue to hit the market, either in that form, under the Xtreme Legends side story series, or through the "new" Samurai Warriors brand. Polish an old junky car and it doesn't change the fact that it runs the same. Sadly, this is the same case that essentially puts a nail in the coffin for Dynasty Warriors Vol. 2, even if the sequel shows a few signs of improvement that we wouldn't mind seeing down the road. 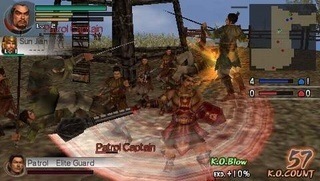 The game takes place in ancient China, with numerous warring clans sparring against each other for pure dominance. Your player chooses one of their warriors in the clan and then strikes back like there's no tomorrow, hitting soldiers left and right with combo and musou attacks and garnering new-found enemy, armor, and other items. The stage layout is relatively simple. Instead of a full, free-roaming engine like the console versions have, Vol. 2 instead works in a grid system, moving from battle to battle. Players select a connecting square on the grid and are instantaneously transported to that area, where they fight against a certain number of enemies until it's taken over. This system was also present in the first game, but it was heavily plagued by loading time. Here, the loading has been greatly fixed, so that the game moves a lot faster. There's also something to be mentioned with multiplayer functions offered within Dynasty Warriors Vol. 2. Four players who own a PSP and a copy of the game can hook up in different multiplayer contents, the most engaging being a King of the Mountain-like battle at the top of a tower. This isn't a fully engaging mode, mind you, but it's certainly a worthwhile extra that adds to the longevity to the game...in which it otherwise has none. The big problem with Dynasty Warriors Vol. 2 is that, in essence, it's really just another game in the series with little to no changes in the gameplay. Following soldiers and weapons can be powered up, but their performance changes very little on the battlefield, and some of them even meet a brutal end if you don't watch their back enough. The rest of the gameplay leans on the same combos done over and over again. 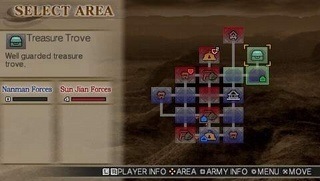 Koei refuses to variate the gameplay to the point that new combos or air attacks can be discovered, and that makes the game as mundane as it's been over the past few years. Worse yet, the graphics have seen better days. Once again, the worst enemy to the player happens to be the camera. During the heat of battle, players will slash away at soldiers in front of them, but the camera perspective doesn't really reveal who's BEHIND the player until they've already taken a couple of crucial hits. Yeah, that's fair. Like a fight on a school playground where you have fists and the other kid has a car. Real fair. The graphics otherwise are mostly sloppy, with bad pop-in and limited animation. The audio's not really any better, repeating bland hard rock music and sound effects. Fortunately, the ultra-lame dialogue reading is nowhere to be found, instead reduced to quick text. With nothing new in story, gameplay, or looks, Dynasty Warriors Vol. 2 eventually suffers the same fate as the previous games before it- it just gets too old, too damn quick. Fans will probably eat this one up for its multiplayer features and improved board game-ish set-up, but everyone else will want to wait until Koei institutes some REAL changes into the game. Or maybe it's time to kill the series entirely and just work up something entirely new from scratch- kinda like they did with Gitaroo Man. What's Hot: Multiplayer modes are interesting; the board game-like set-up works better this time around. What's Not: Super-repetitive gameplay; camera problems become bothersome.